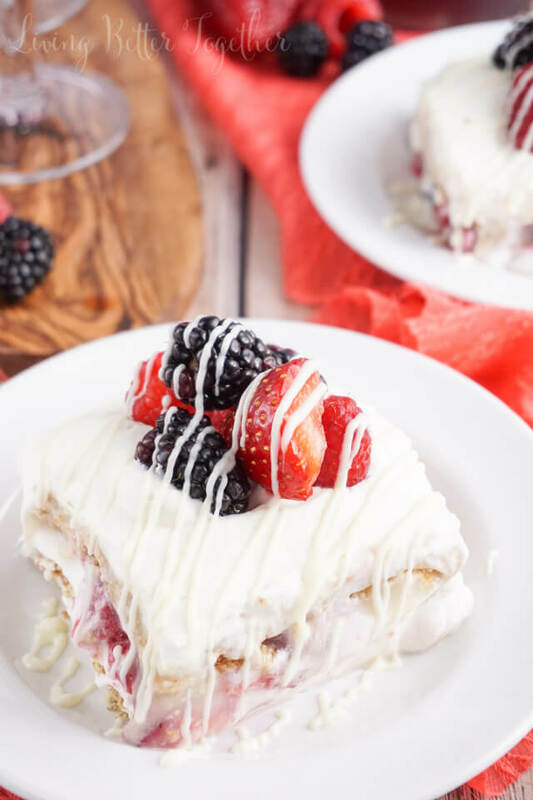 This Berry Wine Icebox Cake is a simple no fuss dessert perfect for summer. 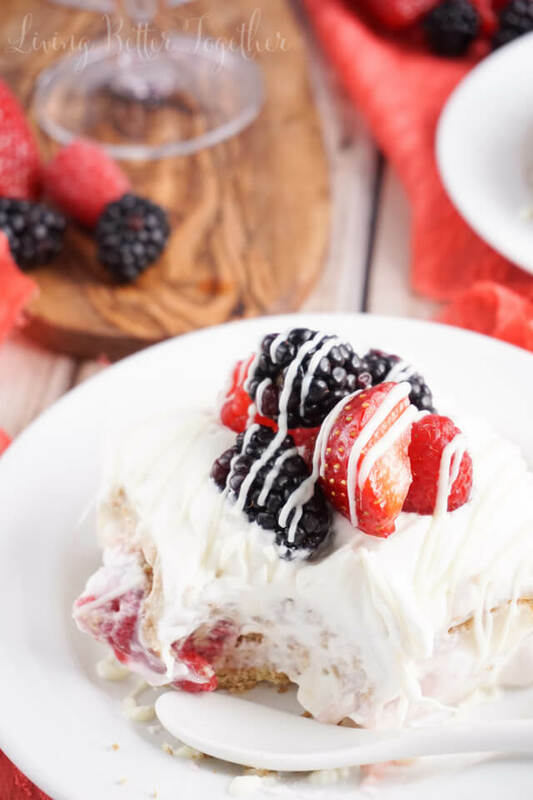 It’s made with wine macerated berries, graham crackers, white chocolate pudding and homemade whipped cream! I feel like I haven’t seen the sun in months, that’s probably because I haven’t, but I have faith that sunshine and warm weather are on their way! My hope is that we’ll come home from vacation to some beautiful weather just in time for Memorial Day. After all, Memorial Day really does kick off summer. Everyone starts prepping the pools and pulling out the grills and planning road trips. This is generally the time of year when most of us don’t really feel like baking. It’s too hot to be in the kitchen and we want to spend every precious moment soaking up the sun and creating memories with our friends and family. But just because we don’t feel like baking, doesn’t mean we can’t throw together a simple and fast dessert to impress our guests. 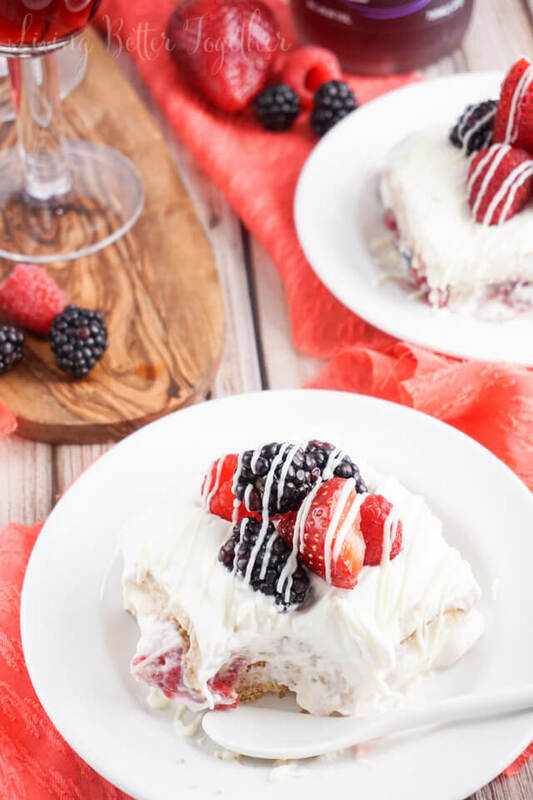 This Berry Wine Icebox Cake is just the thing you need. Have you ever made an Icebox cake? They’re genius and they taste delicious! You really can’t beat a recipe where the fridge and time do all the work. It’s so simple to whip up and place in the fridge while you play a round of croquet and eat a couple hot dogs, and by the time you’re ready for dessert all you have to do is pull it out. I’ve made a lot of icebox cakes, and hope to share more of my recipes here with you this summer. This one in particular is extra tempting because the berries are macerated in Arbor Mist wine and sugar before being added to the cake. 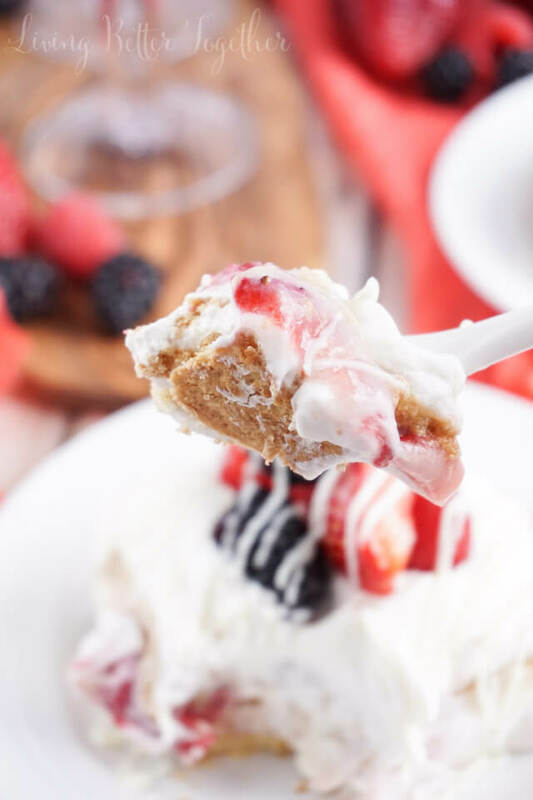 I always use my Perfect Homemade Whipped Cream for my icebox cakes, it keeps them light and allows the other flavors of the cake to really pop! Add some layers of white chocolate pudding and graham crackers and we’re in business! 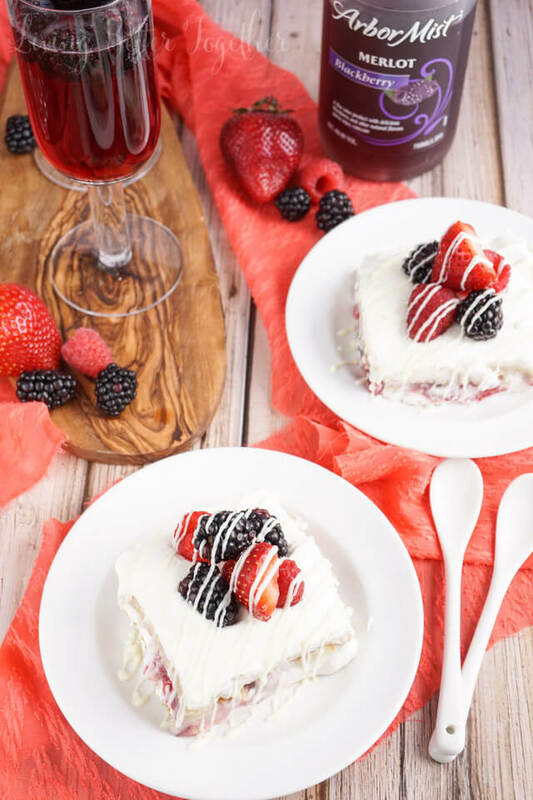 This Berry Wine Icebox Cake is a simple no fuss dessert perfect for summer. It's made with wine macerated berries, graham crackers, white chocolate pudding and homemade whipped cream! Add berries, sugar, and wine to a large bowl and mix together. Cover with cling wrap and let set for 30 minutes, stirring halfway through. 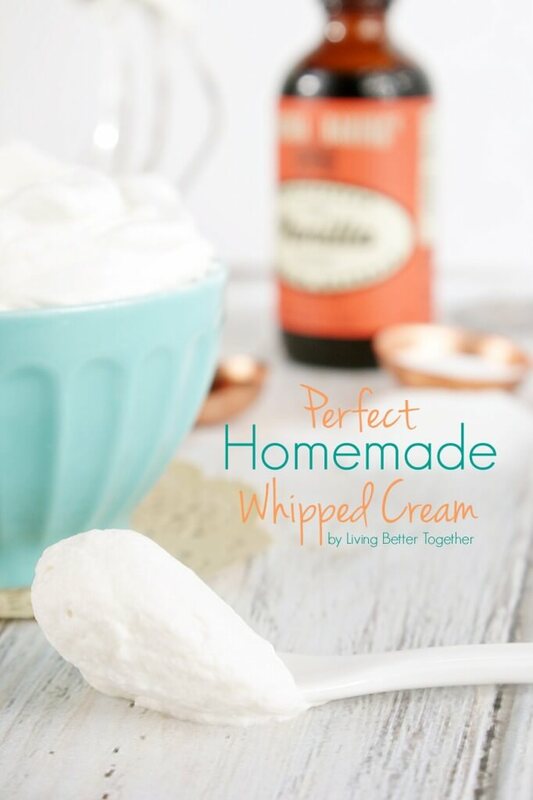 Prepare whipped cream and set aside. Prepare pudding according to package instructions and set aside. In a 9 x 13 baking pan, lay a layer of graham crackers out, covering the whole bottom, about 7 1/2 grahams. Add about 1 1/2 cups of whipped cream to the graham crackers and spread out evenly. Evenly spread out a layer of pudding. Add another layer of whipped cream. Add all the berries as a layer. Fill in the gaps between the berries with pudding. Add another layer of whipped cream, pudding, and graham crackers. Add a final layer of whipped cream and cover with foil and place in the fridge for 3 hours. 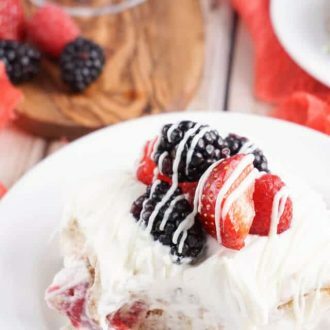 Top with fresh berries and drizzle with melted white chocolate. Now it wouldn’t be a party without some refreshments. I don’t drink a lot of wine, but when I do, I like it to SPARKLE! I’m particularly fond of fruity wine spritzers in the summertime. They’re simple to throw together and there aren’t any extra tools needed to make them. 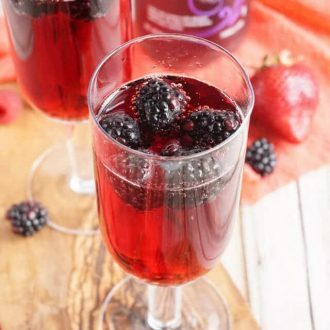 These Blackberry Wine Spritzers are one of my favorites, Matt even likes them and he’s not really a wine guy! 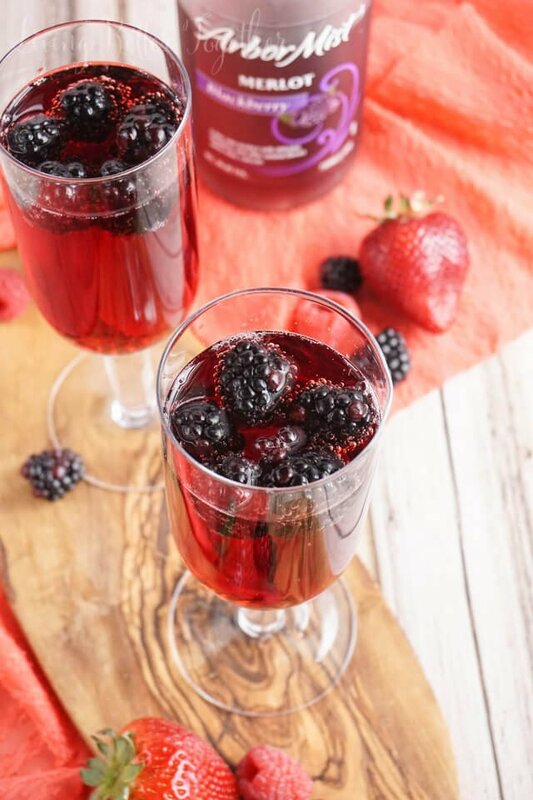 I like to use Arbor Mist wines because they’re fruity and sweet and a little fizz makes them perfect for summer nights of entertaining. A simple and refreshing blackberry wine spritzer for summer that's made with just three ingredients! 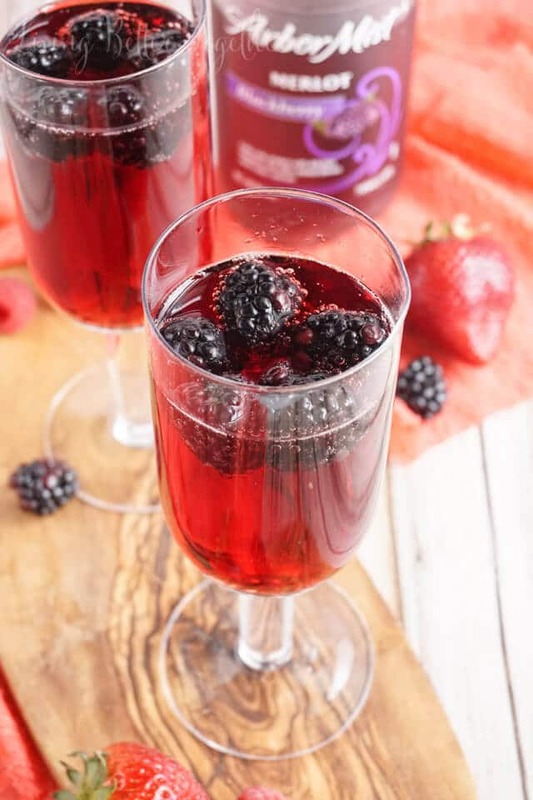 Add berries to flute, add wine, and finish off with club soda. You can easily substitute in your favorite Arbor Mist wine. What’s your go to summer dessert? Do you go for the fruity stuff or keep the sweet stuff going all summer long? Don’t forget to check out the Simple Entertaining Social Hub and enter the Arbor Mist Summer Sweepstakes where (1) lucky winner will win a brand new water sport vehicle and (100) others will win Arbor Mist beach themed prizes! OMG this is soooo delish looking. Must try this! Thanks for the great tips and recipe/drink ideas. I’ve never made an icebox cake but this looks so good! Pinning! Thanks, Kelly! Icebox cakes are soooo easy to make, I love them!